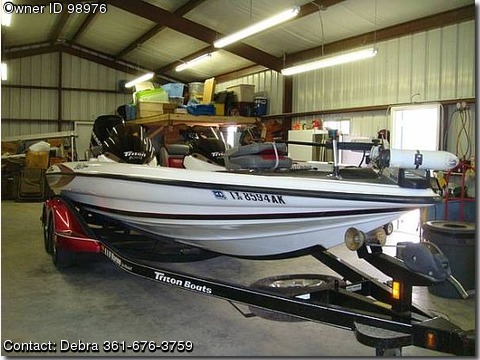 Boat is located in Goliad,Texas.Please contact the owner @ 361-676-three seven five nine or debra(at)designedbyme(dot)com...EXCELLENT PRICE FOR A VERY FAST BASS BOAT Detailed Vessel Description: 2006 TRITON Tr21X High Performance series competition bass boat with dual console windshields and a 225 HP Mercury Optimax Pro XS motor. The motor was just overhauled by Victoria Marine and they installed a brand new Power Head and Lower End unit with ZERO hours. Hours on the original motor were 288. This boat has been used very little and has been garage kept. The dual axle trailer and tires are in excellent condition. This boat has everything you need for serious Tournament fishing. Carpet was replaced in summer of 2013 and the seats have recently been re-upholstered. The compartments are lighted and it includes a Lowrance GPS/fish finder, Motor Guide 32 amp trolling motor, 2 large live wells, a large deck area. Tons of storage in the 2 huge compartments for fishing gear and 2 large compartments for additional rods along each side of the deck. There are also 2 additional storage compartments on either side of the live fish wells. Specific Information About The Vessel Condition: New upholstery! Seller has not used much in the last 5 years. The only issue with the boat is the front fish finder is not working. A $500 deposit will be required to hold the boat until final payment has been made. Payment must be made within 48 hours of deposit. Cash, cashiers check and bank checks are acceptable. Personal checks, credit cards or PayPal will not be accepted. The asking price is $29,995 or reasonable best offer. The boat will need to be picked up from its current location in Goliad, Texas. Delivery can be negotiated if the delivery is within 350 miles of Goliad, Texas. The cost for delivery would be .55 cents per mile for the round trip.